Mind over Matter you say? 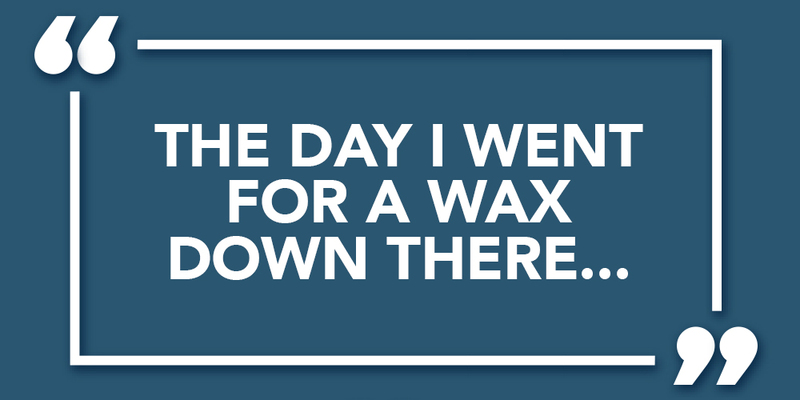 One Man’s Story of survival on the Waxing table! Men are not cut out for hair removal. A man can eat nails, drive a Harley, become a Navy Seal, and still snivel before a pair of tweezers (or as I like to call them, Devil’s Chopsticks). It is baffling that women endure this pain — repeatedly — for any cause, including their own salvation. I lay in the waxing chamber, where everything was fresh and folded and blindingly white. Was I in for surgery or hair removal? As instructed, I removed my clothes and assumed the position. It was like lying on a chiropractor’s table, only face up with legs spread in gynecologic uncertainty and, on second thought, nothing like the chiropractor at all. A cheery voice interrupted my willies: “You muss be the lucky man.” And in she walked, a stout Argentine woman whom you liked instantly even if she was about to rain terror on your netherparts. Her name was Blanca, but she answered to anything that sounded like cries for mercy. For some reason, it only now occurred to me that Blanca would see me naked. I felt like we should get to know each other, have a drink or something, but she went right to work like a mother changing a diaper. Blanca showed me the instruments of destruction: liquid wax, cloth strips, and a box of Kleenex (for my eyes). I asked Blanca what made a wax Brazilian. Despite my hopes, it had nothing to do with live samba dancers. “The Brazilian is when everything goes, even where the sun no shine. The Hollywood, however, is when you leave a little strip…” She demonstrated. I asked her if we could start with a colder, more conservative country, say, Poland. Blanca laughed as she dipped her rag in hot — extremely hot — wax. She laid the strip on my skin and, coaxing me in tender tones, rrrripped the hair from Mr. Giggles. It is hard to describe the pain that attended. Normally we are present to a range of sights and sounds, grounded for the most part in reality., nothing existed outside the sting between my legs. Somewhere in the distance a dog barked. I yelped in some new language and had a mini-seizure. “Is okay, beautiful, see.” Blanca showed me a strip of fur that belonged somewhere else. So it went, strip after strip, my torso arched backward like one demented Slinky. Blanca assured me that “is almost over,” then rrrripped again. I looked to her the way one does a flight attendant in turbulence: her smile was all I had. Tears welled up, but I sucked them back in with my eyeballs. Women wax all the time, right? I thought about my wife. Maybe she would take me for ice cream afterward. With every pass, the wax got hotter. I asked Blanca if the heat would max out at some non-scalding temperature. Her perfectionism was killing me. Blanca told me to close my eyes and relax, but every time I got to my happy place, she ripped it out of me. It’s a little-known fact that the man who coined “mind over matter” died of a Brazilian bikini wax. I’ve endured tattoos, carpentry stabbings, and a bee sting that made my lips look like Meg Ryan’s, and none of it could have prepared me. Finally, mercifully, we reached the end — the real end. Blanca had clear-cut Florida, Georgia, and Alabama, leaving no shrub unfelled. I looked down at my new friend, a turkey made hairless, waddle and all. “Perhaps if I encounter some issues with my memory down the line.” I tipped Blanca not for the wax but for the psychotherapy. It has been a week, and I’m still not myself. I’ve acquired a facial tic and other hints of post-traumatic stress disorder. The draft in my basement won’t go away. I feel less manly, Samson without his pubic hair. I’ve stopped showering at the gym, and it may be years before I can eat Brazilian nuts.